Tidy Bingo has landed a place on our Blacklist. The site is under new ownership and we have been notified an affiliate marketing program is no longer offered. This has caused a breach in our original agreement with Tidy Gaming Ltd.
Marketing services has been provided for the brand and going forward, the commissions owed for player referrals will not be paid to affiliates despite the services that have been provided. Based on these unethical business practices, we do not recommend this bingo site to players. Cleanliness is next to Godliness and keeping a house in tip-top shape is ideal. Tidy Bingo is an online site that keeps its house immaculately kept to provide players with the best Bingo experience possible. Graphics are crisp, navigation is a snap and promotions are exceptional. The landing page has a homey appeal dressed in house that fits any neighborhood. From their house to yours playing bingo couldn’t be cozier with a spectacular line-up of great gaming entertainment. Tidy Bingo opened their virtual doors in August 2013 and is gaining a lot of attention from the community. Jumpman Gaming is on the rise making this their 11th brand in a short period of time. The software is dedicated to premium Bingo products offering state-of-the-art graphics and Instant Play access that requires no tedious downloading. Tidy Bingo is fully licensed by the Alderney Gambling Control Commission and a member of the 15 Network. SQS has tested the software and has met the standards of approval. At the moment there is 90 and 75 ball bingo available. One of the extraordinary perks is allowing players to play up to 5 games simultaneously. Tickets are reasonably priced and ideal for budget minded players starting at 1p up to £1 each. Pre-purchase tickets in advance is an available option to ensure not missing out on any of your favorite schedule games. Progressive Jackpots and Guaranteed Fixed Pot games are offered. Specialty games add more thrills to your bingo game with Lucky Stars, Cash Cloud and Glitz ‘n’ Glamour. Free Bingo is available to all depositing players on a daily bases rewarding prizes to the winners. Gather 4 of your friends for Team Bingo with a heap of Loyalty Points awarded to the winners. Other games include Slots, Scratch Cards and for table enthusiasts Blackjack and Roulette is offered. Tidy Bingo doesn’t offer a free no deposit bonus but has a sweet first time deposit Bonus with an added treat. Make your first deposit and receive a handsome Bonus. But the rewards don’t stop there because players will have a spin on the exciting wheel with loads of extra cash to be won. The wheel has up to £2,500 up for grabs and will be added to your account for an even better starting advantage. 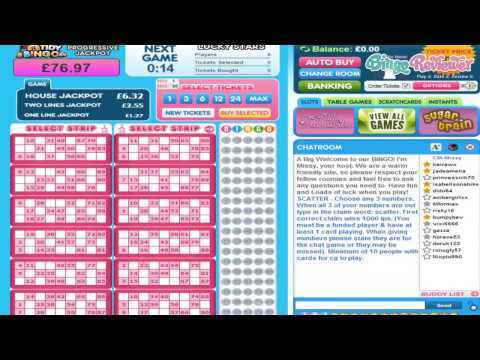 Chat Games and Tournaments liven up the Bingo rooms with loads of Loyalty Points ready to scoop up. The valuable points can be redeem for bonus funds. Every 1000 points earned is equivalent to £1. You’ll find the standard Network Bonuses but also exclusive promotional offers. There is plenty of lucrative offers for every day of the week. Mondays are never dull in the Lucky Stars room where 1 line bingo pays more than the Full House. Hang the apron up and stay out of the kitchen on Friday Nights because if you win Free Takeaway is your reward delivered straight to your door. Playing in multiple bingo rooms’ simultaneously is a luxurious feature for players. Raffle draws throughout the month and a VIP scheme that offers Cash-back, Birthday Bonuses, mystery gifts and exclusive Jackpots are just part of the perks. We rate Tidy Bingo with 2.25 Pink Hearts. I was very happy with this site. My only real complaint is that I feel they could use a little bit of work when it comes to the layout. Although there are a lot of colors utilized, there is also a lot of white space in which they did not do much with. I was definitely impressed with their welcome bonus. They start you off with a £20 bonus as well as a free spin on their bonus wheel. It’s always nice to get two bonuses in one! Pus you’re guaranteed at least £5 on the free spin, with a maximum take away of £2,500. I managed to snag an extra £20 on my spin. Sure, it was no £2,500, but it was definitely something! They have tons of awesome promotions for players to take advantage of while playing here, including free bingo, bargain bingo and tons more. Free bingo is offered daily! I still have a thing or two to learn about JumpMan software, since I haven't played a lot of their games, but so far it looks quite decent. The site uses a similar template to many others that I have seen, so you won't see any original elements to make it unique or different. I wish that they decide to do something about it, and I believe the new and fresh layout would do wonders for attracting new players. As for Bingo rooms, you will find the regular games (75 ball and 90 ball) with six rooms in total, which is not that bad. There is one free room, for funded players only, with a £1 pot, for those who don't feel like risking the real cash. There is no trial or no deposit bonus, just a regular depositing and reload bonuses, but you do get one spin the wheel on your fist deposit.